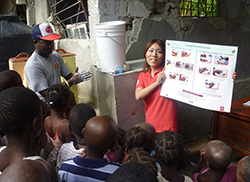 As of January 2017, AAR Japan has concluded all of its relief activities in Haiti. 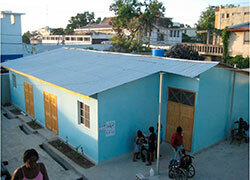 In January 2010, Haiti was devastated by a catastrophic magnitude 7 earthquake. In response, AAR dispatched an emergency assistance team. AAR established an office in the capital Port-au-Prince, delivering food supplies and engaging in various projects, such as the rebuilding of child care facilities and facilities for persons with disabilities (PWDs), promotional activities for hygiene, and inclusive education. In April 2016, seven years after the quake, the office in Port-au-Price was closed, but our work with inclusive education continued in collaboration with local organizations. Then in October 2016, Hurricane Mathew caused a tremendous amount of damage to the country, prompting AAR Japan to take action and dispatch its emergency assistance team once again to support those who were affected. As of January 2017, all of the organization’s work with promoting inclusive education and supporting victims of Hurricane Mathew were completed and thus our activities in Haiti had come to an end. The following is a report of AAR’s activities and its results which were made possible by your support. On January 12th, 2010 (local time), a strong magnitude 7 earthquake struck the Republic of Haiti. Even before the earthquake, Haiti had long been considered the poorest nation in the Western hemisphere. As it turned out, the impact was devastating as a result of various combining factors; the earthquake having directly struck the highly populated capital, the sheer scale of the earthquake itself, and a fragile social structure due to the country’s volatile political situation. In light of this situation, AAR sent an emergency assistance team to the ground on January 25th, consisting of 4 staff members from our Tokyo Office, which distributed emergency relief packages, waterproof sheets and other aid items to 13,400 households overall (approx. 67,000 persons) by April 2010. Both emergency relief packages, consisting of food and daily goods, and waterproof sheets were procured from the neighboring Dominican Republic, and were transported to Haiti by land. 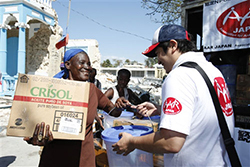 The relief packages included food items familiar in Haiti such as rice, beans, pasta, biscuits, cooking oil, canned fish, canned sausage, candy, water, UHT (Ultra-high temperature processing) milk, UHT fruit juice, as well as daily goods such as buckets, soap, towels, washing powder, sanitary pads, candles, matches, and toilet paper. These items were delivered to those living in the evacuation center and establishments for persons with disabilities in and around Port-au-Prince that did not have access to sufficient assistance. We also delivered school equipment to three schools and eighteen child care facilities. In addition, AAR provided rice to care facilities that were suffering from a food shortage. With the earthquake, many of the people affected by the disaster were left with physical disabilities as there were wide scale collapses of buildings as well as major delays in the rescue effort of those who were injured. St. Vincent School, which AAR supported, was the largest educational/medical facility in Port-au-Prince that supported persons and children with disabilities. After the earthquake, this school opened its classes in tents covered by waterproof sheets. However, these temporary structures often collapsed due to heavy rain and other conditions, forcing classes to be cut. Also the hospital itself was badly damaged, leaving the facility unable to provide proper medical services. AAR constructed temporary clinics and school facilities, as well as providing medicine and installing medical equipment for the clinic, as well as a prosthetic brace workshop which is scarce in Haiti. In areas with limited access to medical services, rounds of medical visits were organized, with the traveling clinic setting up stops at small orphanages. 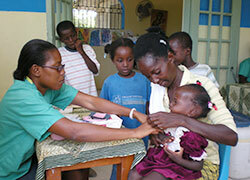 Within a two month period, 8,484 children in 37 locations received medical examinations. AAR also provided support for 71,231 persons to be able to regain safe living conditions by rebuilding three facilities for PWDs, nine orphanages, two education facilities, as well as training human resources for the management of said facilities. In October 2010, half a year after the quake, the first case of cholera was confirmed in Latibonit Province, Northern Haiti. The disease had spread to larger areas with the death toll rising to 9,000 throughout the nation, and it is reported that the disease continues to spread further after the hurricane in 2016. As many child care facilities in the suburbs of Port-au-Prince suffer from poor hygienic conditions, AAR started a project to visit these facilities with the aim of preventing cholera infections. The first step was to provide the facility staff with information on how cholera is transmitted and how it may be prevented, using brochures published by the National Ministry of public Health and other organizations. AAR also distributed Oral Rehydration Solution (ORS) that can ease dehydration that occurs with cases of cholera infection, and organized seminars for children on how to wash their hands using soap. 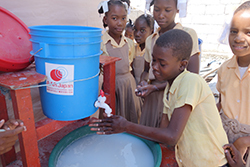 After these initial steps, AAR provided the installation of toilets and hand washing stations in the elementary schools of the capital Port-au-Prince, promoting education on hygiene in order to protect specially children who are more vulnerable to disease. Through its projects, AAR installed toilets in eight elementary schools, along with a rainwater storage tank for children to wash their hands, and organized seminars for teachers on how to effectively teach the students about hygiene. As a result of supporting the formation of hygiene clubs, where children themselves take the initiative to engage in hygiene based activities, students begun to teach each other as well as some taking on the challenge to clean their school by themselves. In Haiti, the enrollment ratio for children with disabilities in primary education is approximately 2% (Commision de l’Adaptation Scolaire et d’Appui Social), as a majority of them are unable to attend school. Since March 2015, AAR began promoting inclusive education (education in which all children, regardless of their differences such as disability, race, or language, can receive adequate learning that corresponds to individual abilities and needs) for children with disabilities in the Carrefour region, a suburb of Port-au-Prince, the capital city. As a result, the survey found that there are 48 children with disabilities in the region who were not previously known, thus adding them to the group of children eligible for the project, to which only 94 were already known, making a total 142 children. The project provided 35 members of school, including teachers and administrative staff, with training on education for children with disabilities, implemented awareness activities in which 3,287 people participated, and paved ways for the establishment of parents’ association to support the children in their communities. As a result, three children with disabilities, who previously did not attend educational institutions, had since joined school. AAR expects the number of children to rise in the future. On October 4th, 2016, the powerful hurricane “Mathew” made its landing in Haiti, causing devastation in which 546 people died and 438 were injured as of October 17th (UN office for the Coordination of Humanitarian Affairs). AAR sent in an emergency assistance team and delivered aid goods such as food and sanitary products to 1,000 households to persons with disabilities in Grand'Anse Province and South Province, areas that suffered a great deal of damage. In addition, we delivered crutches and walking aids to five organizations for PWDs, as well as education materials to three elementary schools (200 sets each). By January 2017, all of AAR’s work related to aiding those affected by the natural disasters as well as the promotion of inclusive education came to an end. Even to this date, many continue struggling in their daily lives in Haiti, a country that had already been one of the poorest in the region before the earthquake. The country’s hygiene situation and education system still have long way to go, remaining ever vulnerable to disasters. Due to the volatile political and safety situation, the continuation of these projects were made difficult, resulting in our decision to conclude all activities in Haiti in January 2017. However, AAR retains its ties with Haiti, closely monitoring the situation and will be ready to provide support should there be any emergency such as another natural disaster in the future. We would like to thank you for all your support to this date. We would like to ask for your continued understanding and support for AAR’s work. KATO did her graduate studies on Social Development in the United Kingdom, and joined AAR in 2010 after working for government affiliated research institutions and diplomatic missions. After working as the Director of Tohoku Office, she is currently assigned to Tokyo office and is responsible for the organization’s projects in Zambia as well as Great East Japan Earthquake Relief Activities. KATO is originally from Tokyo. *Profile as of the date of the article. This article has been translated by volunteers as part of the AAR Japan's Volunteer Programme. Their generous contributions allow us to spread our activities and ideas globally, through an ever-growing selection of our reports from the field. Association for Aid and Relief, Japan (AAR Japan) is a Non-Governmental Organization (NGO) based in Tokyo, Japan with projects in the areas of emergency assistance, assistance to persons with disabilities, mine action, action against infectious diseases and public awareness raising. Established in 1979 as an organization with no political, ideological or religious affiliation, we aim to extend emergency and long-term support to the people in need of help. Since 1979, we have operated in over 60 countries and areas, and are currently active in Japan and other 14 countries. We are currently seeking English-speaking volunteers who can proofread and edit the activity reports translated by our Japanese volunteers. If you have solid English writing skills and are interested in AAR Japan's activities, please contact us here.